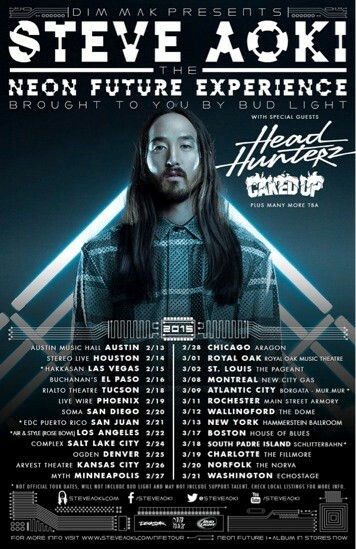 Steve Aoki recently announced that he is returning to North America for his biggest tour yet this coming winter. 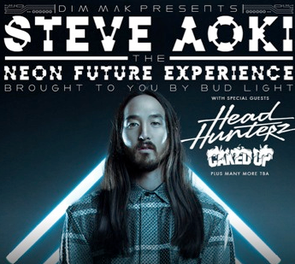 Dim Mak Presents Steve Aoki’s Neon Future Experience will launch 13 February in Austin. Joining him on the tour are support acts Headhunterz and Caked Up, plus many more to be announced. Along with the tour news, Steve Aoki revealed his newest music video for ‘Get Me Outta Here’ with Flux Pavilion, off his recently released album ‘Neon Future 1’. Lord Danger director Tom Cole puts his spin on the film, which features Steve escaping a major dust storm while Flux Pavilion guides him to safety. This tour will support his current album, while giving clubbers a taste of the second installment of the album, ‘Neon Future II’, set for release this spring. The tour will hit over 40 cities that include New York City, Montreal, Washington D.C., Houston, El Paso, Phoenix, San Diego, Boston, Denver, St. Louis, Chicago and more. Other stops outside of the tour include his residency at Hakkasan in Las Vegas at MGM Grand, EDC Puerto Rico and the Air & Style Festival in Los Angeles. Additional dates will be announced soon. The show will feature a brand new custom stage set and visuals by V Squared Labs, whose works have been featured on the main stages of Electric Daisy Carnival and Ultra Music Festival. This new design combines custom built LED cubes with mirrored panels to create a new visual experience, giving fans the illusion of both depth and clarity. One dollar of each ticket sold for the shows will go towards the Steve Aoki Charitable Fund, where he uses his influence to raise money for relief organisations dealing with these issues through money raised at his own touring events, memorabilia auctions and partnerships with likeminded artists.